In 1722, the British government granted English iron manufacturer William Wood permission to proceed with a patent to coin £100,800 worth of copper halfpence for Ireland. The patent had originally been granted to the duchess of Kendal, one of George I’s mistresses, who then sold it to Wood for £10,000. the generality of people here alarmed and greatly dread the consequence of such a project…This is in my opinion a matter of vast consequence both to his Majesty and the subjects for if it be not managed with the utmost caution, it will drain the Kingdom of the little gold and silver that is left in it, and complete the general misery which is already intolerable. Opposition to the so-called brass money became a rallying cry for both the Protestant establishment and much of the populace of Dublin. There was no challenge to the right of the king to issue coinage, but there was deep resentment at what was seen as exploitation of Ireland. The campaign against Wood’s halfpence was blessed, moreover, with the services of a propagandist of genius, Jonathan Swift, dean of St Patrick’s Cathedral, who was a great literary ventriloquist. He invented the character of a Dublin ‘Drapier’ as the author of several open letters attacking the coinage. He also wrote anonymous poetic broadsides. The title of the first, ‘A Serious Poem upon William Wood, Grazier, Tinker, Hard-Ware Man, Coiner, Counterfeiter, Founder and Esquire’, gives a good flavour of their tone. The British government under Robert Walpole refused to withdraw the patent. The Dublin parliament, which had been humiliated by the Declaratory Act of 1720—which made it subordinate to Westminster—then sent a resolution to London attacking the coinage. By April 1724 Grafton was replaced as viceroy by Lord Carteret, and a committee of the privy council recommended that the amount of coinage issued be reduced to £40,000. 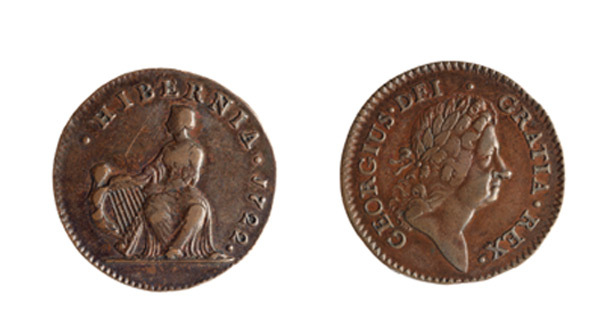 These concessions were accompanied by an insistence from London that ‘the affair of the coinage was now come to be an affair of State wherein the honour of the King and the English Nation were more materially concerned’. The halfpence had become a point of principle for both sides. In the end the government capitulated. In August 1725 Wood’s patent was withdrawn—he was secretly compensated with a pension of £3,000 a year from Irish revenues. The affair marked the emergence of a strain of Protestant ‘patriotism’, one that did not seek to include Catholics as citizens but did insist on the idea of Ireland as an independent and equal kingdom. ‘You ARE’, wrote Swift’s Drapier, ‘and OUGHT to be as FREE a People as your Brethren in England’. It was a notion that would have an ambiguous life in Protestant Ireland but eventually a more potent one in America.